Background: Reducing dietary Crude Protein (CP) and supplementing with certain Amino Acids (AAs) has been known as a potential solution to improve Nitrogen (N) efficiency in dairy production. Thus understanding how AAs are utilized in various sites along the gut is critical. Objective: AA flow from the intestine to Portal-drained Viscera (PDV) and liver then to the mammary gland was elaborated in this article. Recoveries in individual AA in PDV and liver seem to share similar AA pattern with input: output ratio in mammary gland, which subdivides essential AA (EAA) into two groups, Lysine (Lys) and Branchedchain AA (BCAA) in group 1, input: output ratio > 1; Methionine (Met), Histidine (His), Phenylalanine (Phe) etc. in group 2, input: output ratio close to 1. AAs in the mammary gland are either utilized for milk protein synthesis or retained as body tissue, or catabolized. The fractional removal of AAs and the number and activity of AA transporters together contribute to the ability of AAs going through mammary cells. Mammalian Target of Rapamycin (mTOR) pathway is closely related to milk protein synthesis and provides alternatives for AA regulation of milk protein synthesis, which connects AA with lactose synthesis via α-lactalbumin (gene: LALBA) and links with milk fat synthesis via Sterol Regulatory Element-binding Transcription Protein 1 (SREBP1) and Peroxisome Proliferatoractivated Receptor (PPAR). 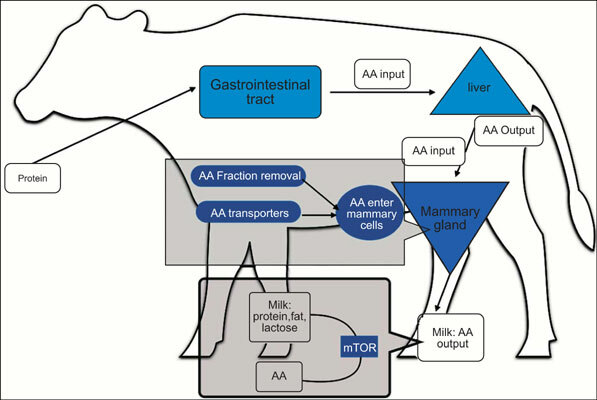 Conclusion: Overall, AA flow across various tissues reveals AA metabolism and utilization in dairy cows on one hand. While the function of AA in the biosynthesis of milk protein, fat and lactose at both transcriptional and posttranscriptional level from another angle provides the possibility for us to regulate them for higher efficiency. Flow, liver, mammary gland, utilization, milk protein, mTOR.